AT the approach of night the gates of the cities in China, and the barricades at the end of each street, are carefully shut. During the night no persons of credit are seen in the streets which abound with watchmen, who strike upon a piece of bamboo in their left hand, to denote the time and to mark their own vigilance. Those whom they meet in their walk are questioned and if the reply be satisfactory they are permitted to pass through a wicket in the barricade. The watchmen carry lanterns, upon which are written their names and the district to which they belong. In the very hot months, all the lower classes of Chinese have their feet and legs bare. The Costume of China by George Henry Mason published by W. Miller, Old Bond Street, London May 4,1799. 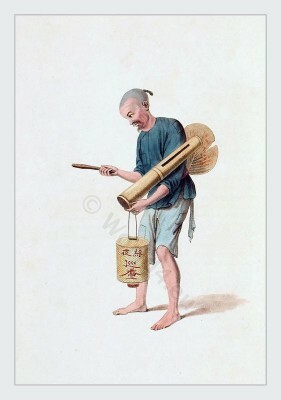 Chinese people at their occupations and applying their crafts. This entry was posted in 1799, 18th Century, Asia, China, Traditional and tagged Traditional Chinese costumes, Traditional Chinese Mens Dress on 12/3/13 by world4.